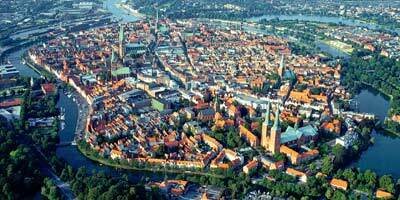 Lübeck is an essential stop on any tour of Northern Germany. The former "Queen of the Hanseatic League" has been a UNESCO World Heritage Site since 1987. Glance at the photo above, and you'll see a few of the things that make Lübeck special: a compact Altstadt; a medieval street layout surrounded by a river and harbor that once doubled as a moat; seven great churches with spires that reach toward the Northern sky; and--a few kilometers beyond the city center--the former fishing village of Travemünde on the Baltic Sea, a popular beach resort that once served as Lübeck's gateway to the Hanseatic trade routes in Northern Europe. Some 1,300 houses, churches, and courtyards within the Altstadt are protected historic monuments, and the town's authentic Hanseatic look and atmosphere make it a popular destination with Germans, Scandinavians, and other Europeans throughout much of the year--including winter, when the Lübeck Christmas Markets are packed with visiting Swedes, Finns, and Germans. We'd recommend spending at least a couple of nights in Lübeck--or even longer, if you're interested in local boat excursions or visiting the beach at Travemünde. Photo: Lübeck Travemünde Tourismus / n.n.